The Minnesota Twins have never played the New York Mets in a World Series, but when it comes to having Kosher food at the ballpark the Twins win. Kosher Sports Inc. had been the exclusive Glatt Kosher provider at Shea Stadium, the former stadium of the NY Mets, since 2006. 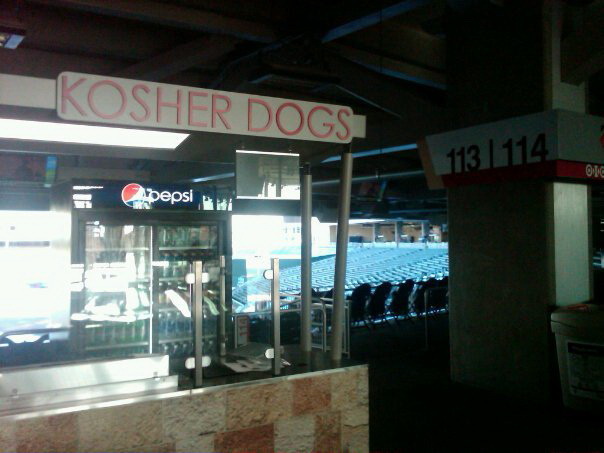 In 2008, the and Kosher Sports Inc. announced a multi-year agreement for the kosher concession company to continue as the exclusive Glatt Kosher concessionaire at Citi Field, which opened in 2009. However, things haven't gone so smoothly in this agreement. So, the case was all set to be heard by a federal judge who was to decide whether a vendor can sell kosher food during Mets games on the Jewish Sabbath. However, that federal judge had to recuse himself from the case because he was seen wearing a Mets baseball hat during a break in the trial and once wore a necktie with the Mets team colors during the trial. Things seem to be going much more swimmingly in the Midwest. Kosher food will be offered at Target Field for the first time. In Target Field's second season as the Minnesota Twins' home field, fans will be able to purchase Hebrew National hot dogs and all the fixings from a strictly kosher card behind home plate. My friend and colleague, Rabbi Avi Olitzky of Beth El Synagogue in St. Louis Park will provide the kosher certification and supervision. I was honored to provide some counsel to Rabbi Olitzky when he launched his kosher certification agency, MSP Kosher, a year ago. It's wonderful to see other Conservative rabbis in the kosher certification arena, helping to create more options for the kosher consumer while maintaining strict standards, transparency, and sound business ethics. The Star Tribune reports that "The cart will still be open Fridays and Saturdays but won't be supervised." I'm glad to see the Twins organization is not causing the same ruckus that led the Mets to a courtroom where Kosher Sports is seeking $1 million for breach of contract. Congratulations to Rabbi Olitzky for bringing kosher hot dogs to the ballpark in Minnesota and to the Minnesota Twins for not messing up a good thing. Of course, Hebrew National is not Glatt Kosher. It's perfectly kosher, I eat it myself and allow it to be served in my synagogue, but it's not Glatt. Different target audience. The food is under Conservative supervision and is open on Shabbos, and is triangle K meat, so bottom line is probably 99% of Orthodox Jews won't eat it and although Orthodox Jews are fewer in number that Conservative, they make up more of the kosher marketplace. Probably only about half of "C" Jews keep kosher to any degree, and how many limit themselves to only kosher meat? Maybe a third? If the twins are going to bother spending the money and effort, they should get some more broad appeal kosher supervision so that Orthodox Jews can eat there. I would hope that your friend who is doing the supervision was forthcoming in telling the Twins that not everyone will be comfortable with this situation. I know of a college in New England that obtained kosher certification for a kosher dining hall and then were shocked and dismayed when a majority of the campus kosher keeping community wouldn't eat there, so they spent the money on certification for nothing. In response to "Anonymous": You may be right about many Orthodox jews not eating this, I believe (as a Conservative rabbi) the point is to stress the importance of Kashrut for Conservative communities. My understanding is that while it will be opened on Shabbat, obviously the food will not be considered kosher on Shabbat and it may even be "rekashered" every Sunday morning. Plus, it is worth it for the Twins because they are meeting the needs of consumers. MSP Kosher is a free service community rabbis are willing to provide to establishments that strive to provide kosher food in the Twin Cities, unlike Minnesota Kosher or some of the VERY expensive alternatives in the Jewish community making it difficult for stadiums to offer Kosher food. This way, the food isn't more expensive than other ballparks concession stands. It is completely different when someone is willing to help the Twins provide this service and not have to worry about the financial burden. There are many "orthodox" Jews that would trust the Kashrus of a Kosher Michigan. They just would not go telling their friends that they do. In otherwords, I see plenty "orthodox Jews" buying a kosher hotdog that has a conservative Jewish heksher - they will just look over their shoulder to make sure that nobody sees them. Many Orthodox Jews trust my hashgacha (kosher certification). As the last comment noted, they just don't run around telling everyone in their community. But that is one of the problems with kosher certification today. It's politicized and observant Jews are scared to death of being ostracized in their communities because of the choices they make. It's simply no longer true that certification has to be by the most Haredi Jew. Truth is, no matter who gives the hashgacha, there will always be Jews who will say it's not strict enough or can't be trusted because of X, Y or Z. It's enough of that. Look what's happened to the kosher food industry. We are all over-paying for kosher meat because the kosher certification industries are charging too much for a hekhsher and getting rid of so much meat that doesn't meet the highest "glatt" standard. Tell me, if you go to a MLB game on a Wednesday night, see Rabbi Olitzky supervising the hotdog stand, see that the buns are pareve and that there is nothing else being cooked on that grille other than the kosher hotdogs (okay, not GLATT*), wouldn't you eat a hotdog? I think most people would. So, what are the reasons they wouldn't? 1) They don't trust Rabbi Olitzky. Why not? Because of where he went to rabbinical school and his stated "affiliation." But the truth is that the most Haredi rabbi could stand behind the hotdog cart with smikha (ordination) from the most right-wing Yeshiva and yet not be a trustworthy guy. 2) They know the kosher hotdogs are sold on Shabbat. What's the issue here? Let's be realistic. If the hotdogs were grilled on Saturday afternoon and sold at Sunday afternoon's game that would be a problem. But do you really think that hotdogs are grilled a full 24-hours before at MLB stadiums? If you're at home on Shabbat afternoon observing Shabbat, do you really care if there are people purchasing hotdogs at the stadium that day? How does that affect you? (For the sake of the argument, we're assuming the concessionaire isn't Jewish). 3. *GLATT: Have you ever asked Orthodox Jews to explain Glatt to you? I have. It's amazing how many of them have no idea what the Glatt designation is. They even think that if it's not Glatt then it can't be kosher. The bottom line is that this is a great thing that Rabbi Olitzky and MSP Kosher are doing. First, your #3 is insulting. Sure, there are many Orthodox Jews who don't know what Glatt is. There are a LOT of Conservative Jews who don't know what kosher is (I don't mean they don't keep kosher, I mean they have no idea of what is actually kosher and what is not. I have had Conservative Jews who "keep kosher" tell me that you can't buy fresh fish at the supermarket because "they keep the salmon next to the shrimp" (while those same people eat cheeseburgers "out". If you want to judge Orthodox Judaism by the lowest denominator of Orthodox Jews, then you have to be honest about the utter failure of Conservative Judaism to inculcate a halachic sensibility in its membership. Second, with all respect to Rabbi Olitzky, who I know as well, your #2 is just wrong. There is actually no problem with eating a hot dog that was cooked on Shabbat on Sunday, as long as you know without a doubt that it is kosher. But the article clearly states that there is no supervision on Friday night and Saturday (and is Avi going and supervising 6 days a week? Is he hiring a mashgiach to be there?) If there is no supervision on Shabbat, why should I believe that the hot dog stand uses only kosher hot dogs on Shabbat? Because you trust them? Do you realize the amount of extra profit they could make if they substituted non-kosher hot dogs for 1 day a week? What about if they run out of Hebrew National dogs-will they close down for the day and say "sorry folks, no hot dogs left?" Will the workers at the stand know enough to make sure to get pareve buns if Rabbi Olitzky is not around? That is the essential difference in supervision and why I would not eat a hot dog under a supervision like this (though I would gladly eat in your house or Rabbi Olitzky's). This is all leaving aside the glatt question. The glatt designation is a reasonable point of disagreement, but any intelligent, respectable Orthodox rabbi will admit that "not Glatt" does not mean "not kosher". Those who eat Hebrew National hot dogs are eating kosher, as long as they were properly prepared. The fact that Orthodox rabbis have, by and large, adopted a more stringent standard for kosher meat does not mean that everything that Orthodox rabbis demand from a kosher establishment (such as a mashgiach temidi for meat restaurants) is invalid or a chumra. By the way, most of the kosher slaughterhouses sell their non-glatt meat to companies like Hebrew National or simply sell it as non-kosher. That is not why kosher meat costs a lot. By the way, at Yankee Stadium, the glatt kosher hot dogs cost the same absurdly expensive amount that the non-kosher hot dogs cost! I never said that non glatt=non kosher. I am Orthodox and I personally would eat non glatt meat if such a thing existed in the United States under supervision that I trusted. I do not personally use the triangle K, but I wouldn't say it is treif, ie it does not treif one's dishes, etc. But the fact that the hot dogs are not glatt are the least of the issues! Yes, Orthodox poeple would not rely on the supervision of Rabbi Olitzky. R. Moshe Feinstein ruled that one can not rely on the kashrut supervision of a Conservative Rabbi. Many Conservative rabbis eat non-kosher vegitarian out; by not being consistently shomer-kashrut, one can not trust their supervision. Also, to accept one's eidut on kashrut, one must be shomer shabbat. Most Conservative rabbis are not shomer shabbat by O standards. Sorry, driving to shul only doesn't cut it. Most Orthodox Jews could not accept the kosher oversight of someone who might think that the Torah was written by committe and the kashrut is an ancient folk custom, or at best "divinely inspired." If someone does not also believe that kosher is a divine commandment and its broach is going against the will of God, then I can not take their supervision seriously. Also, as far as the Shabbat issue, is the Rabbi at the ball park on Shabbat? If not, then there is no maschiach temidi, so how can you trust that they always used the kosher hot dogs and didn't treif the grill. It is a halachic principle (one of the many that the Conservative movement wished away) that you can not accept meat that was left unsealed with a gentile without supervision. I know that Conservative rabbis like to deride everything Orthodox as "Haredi" but I don't think there is anything so haredi about getting some Empire hot dogs (which haredim probably wouldn't eat!) and a local Young Israel rabbi to do the supervision so that Orthodox Jews can eat at the ballpark. My original point still stands that I don't see who is really benfiting from this. Most C Jews that I know who eat only kosher meat (about a third of them) would be perfectly happy with the ball park just telling them, "these are kosher hot dogs" without requiring any supervision. How many people are there that eat there now, that wouldn't before? But there are a lot of O Jews being left out in the cold, who can't/won't partake of this kosher style ballpark. Sorry, but in my opinion, the Mets win, because they are under the Star-K, so I and my children can eat there. Yotzei v'nichnas is a perfectly legitimate form of hashgacha. Not all restaurants have -- or nor -- a mashgiach temidi. Why should this be any different? In response to "Anonymous" as well, have you ever eaten in a Kosher restaurant without a mashgiach temidi? Here in NY, I know plenty of kosher restaurants under ORTHODOX rabbinic supervision that follow the protocol of yotzei v'nichnas. The community accepts them. Secondly, you are talking about a mashgiach being Shomer Shabbat. While I agree a mashgiach needs to be Shomer Mitzvot (and not simply Shomer Shabbat) I think you can also agree that different people have different understandings of what that means. There are certain heksherim in NY that will only hire mashgichim that are Shomer Negiyah. Does that really have anything to do with one's knowledge of laws of kashrut!!?!? The point is that the mashgiach needs to be educated in the laws of kashrut. I think discussions and generalizations on anyones part (both yours and Rabbi Miller's) about what the general Orthodox or Conservative communities do have no place in this discussion. This is about providing a kosher service to the community. Remember, Minneapolis has a large Jewish community (and large Orthodox community) and up until this point no one has stepped forward to provide kosher food for Twins games. I commend Rabbi Olitzky for offering this option to the Minneapolis community -- and for baseball fans everywhere! If Rabbi Olitzky is indeed kashering the grills every Sunday and post Yom Tov, then I say kol hakavod. I think that, for those who consume non-glatt meat, that would be pretty close to an acceptable solution. I only question whether the cart will be there on Shabbat, showing a kosher certificate or even the word "kosher", on Shabbat, when clearly Rabbi Olitzky can not be responsible for the kashrut on Shabbat. It will be misleading for those who do not read the fine print of the certificate. Yotzei v'nichnas is not considered sufficient for any meat restaurant by respected Orthodox kashrut organizations-it is acceptable for dairy and for bakeries. This is because of the reason that the other Anonymous wrote-basar shenitalem min haayin. That is why it is different.